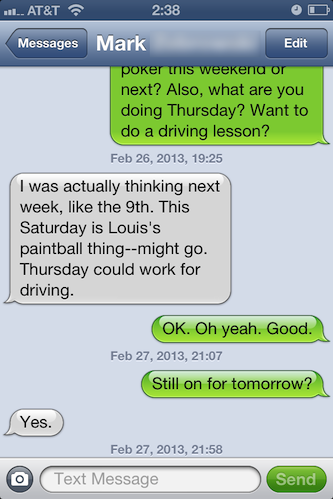 Text from Chris, scheduling driving practice. Did he get his license?? I guess you have to be logged on to facebook... and possibly be my friend, though IO don't have any strict blocks on mine, so maybe not... I'm going to see if I can post a photo in the forums. Here's the thing: Jesse learned to drive in California, SANTA CRUZ specifically, where the scenery is lovely, the sun's out almost all the time and people treat yield signs like merge signs. I actually love driving in California. However, I grew up in the Washington DC area and I hated driving, and ultimately got my license and never used it until I left the area for the midwest and eventually the west coast. DC drivers are terrible, spiteful, close-following, overly-intense people driving in the country's worst, WORST traffic. They can't drive in rain. Or snow. Or in the oppressive humidity for irritability. Need to merge? Too bad. Everything about that sitch is the worst. Or THIS sitch. I live here again. And it's terrible. So there is a feeling of anxiety that surges in me now when I get in the car mostly because people are just so (to borrow a west-coast term) agro here. It's unsettling. So once Chris gets to Indiana he'll probably be fine to learn to drive and will love the friendliness and open, traffic-free spaces of the Midwest. I too grew up near DC, between Baltimore and DC to be more precise (and still live there), and I have to say, although city driving, specifically in DC is the worst, the highways aren't that bad as long as you are willing to be a little aggressive at times too. People can seem spiteful because you need to be assertive while driving in order to make it to your destination in a reasonable time. On the subject of rain and snow, people from the DC-Baltimore area are actually competent in the rain and snow, it's the large out-of-area traffic that is incompetent. Just look what happened near Atlanta when like 2 inches of snow fell. Up in Maryland we were all chuckling as the radio reported people being stuck in their cars on the highway in 2 inches of snow when we were driving down the highway when it snowed 8 inches and was still snowing. Plant Science is no laughing matter!!! As a plant scientist I'm very disappointed by the reactions of the learned John Hodgman and not-so-learned Paul F. Tompkins and Jesse Thorn. Agriculture is, of course, the cultivation of the land, and informally can include animal production systems. Studying the flora side of the agricultural systems has been called "Plant Science" by most (American) Universities for the last 20 years or so. It separates this applied science from Botany, just as the "Life Sciences" are separated from Biology. I would like to heap admonishment upon you all and I hope that you die in a fire. If the judge would like to make amends, I would like him to retell the complete story of attempting to kidnap penguins or pigs or whatever it was that was presented in an abridged format on This american life #226. I have the opposite problem: I HAVE TO BE THE DRIVER in whatever car I am riding. My husband doesn't love it, but he puts up with it most of the time, except when we're driving across the country. If anyone else drives, excluding my two daughters, I get nauseous. If my husband ever contacts you to bring charges against me, I will own up to it in a forthright manner. I will bring a defense of insanity. Question about Jesse Thorn's backstory vis-a-vis his college years at UC Santa Cruz: in the film 'Pulp Fiction', wasn't it Jimmie Dimmock's t-shirts FROM THAT SAME SCHOOL that Vincent Vega and Jules Winnfield were embarrassed to wear, after cleaning their car of the blood and brains, etc.? 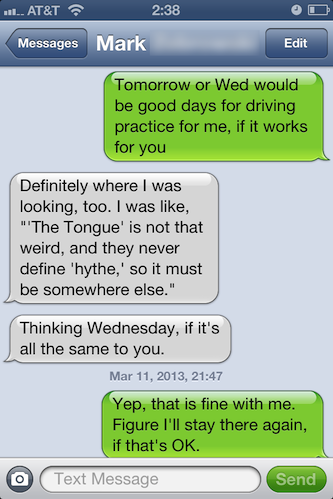 It is mentioned that grammar is going south and the use of myriad/a myriad is mentioned. I have heard this problem before, but thought it had been resolved that both are acceptable. Better reference that happens more often: saying "an historic" or misusing a/an in any of these contexts. The most frustrating part is they think they are being clever for remembering the exception, which is to use "an" before the letter h. This is not actually the exception! Worst offenders are usually news reporters. I lived in Lafayette for 6 years while going to Purdue. Despite its MANY faults, it does have an excellent public transit system due to 40,000 college students. You can get within .5 miles of almost any place in the city using Bus. I found the statement of Paul F. Tompkins, regarding the "sense of freedom", bizarre. I drive. I do not feel freedom when I get behind the wheel. I feel responsibility-- knowing that breaking concentration for even a few seconds can mean a difference of life and death, not just for me, but for strangers I've never met who had no choice in the matter. I don't even have the freedom to look to the side and examine something interesting to my liking-- I can only glance and try to get an impression. Certainly there's a great deal of convenience and utility to driving. There is even excitement. But there's not much freedom. Freedom is when I turn the key, leave the car, and am again at leisure to do whatever it is I actually want to do. I think that if you have been reliant on public transportation or getting someone you know to drive you in the past, you're reliant on the timetable, the wait and other people's time. That might be fine if you've planned everything out ahead of time, but what if you decided, on a whim, you wanted to check out some fancy cafe that is miles away? I think that is where part of the freedom is: knowing that you are able to just 'go out' and do something without having to check on a timetable of sorts or be reliant on others. It's partly the spontaneity that allows for that freedom, but also in some way, driving around with minimal traffic on good scenic routes does provide a sense of serenity.